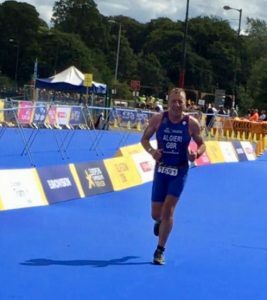 Having watched the professionals in action at the European Triathlon Championships in Glasgow last week, on Saturday it was the turn of GOG triathlete Paul Algieri to race alongside Europe’s finest age group triathletes at Strathclyde Park. Paul was taking on the sprint distance triathlon which comprised of a 750m swim, 20km bike and 5km run. He had a strong swim, exiting the water in 11.56 in second place. The bike course was a hilly 3 lap circuit with only 1km per lap of flat terrain but he dealt well with the challenging course coming off the bike 10th in 37.10. Despite struggling with a recent injury he still managed a 24.10 5km run. His combined efforts saw him finish in 25th place overall in a time of 1.17.49, a fantastic result considering this was his first time competing at this level. GOG Triathlon Club hosted the Welsh Aquathlon Championships on Saturday at Porth Eirias in Colwyn Bay. Eighty entrants from all over Wales had signed up to race the sold-out event, which involves a 750 metre sea swim followed by a 5 km run. Owing to the distances the racing is fast and furious, and in relatively settled conditions some impressive times were recorded. Michael Lewis of Torfaen Triathlon Club took first place with a course record of 27.22 (9.32 swim and 17.10 run). The proceeding results were recorded by a talented group of youngsters, demonstrating that the future of the sport is bright in Wales. Junior Category winner Joe Niven of Mersey Tri was second in 28.09. Youth Category winner Osian Perrin was third in 28.51. Adrian Leonard was the first male home for the GOGs in 9th place overall in 32.10. Next home was Pete Borlace in 33.35. He was followed by Sam Johnson 35.34, Merf Jones 36.34, Paul Hooson 36.45, Andrew Williams 37.01, Pete Ward 37.15, Chris Wynne 37.56, Graeme Tunstall 40.14, Andrew Ellwood 41.49, Ashley Tomlinson 43.14, Malcolm Jones 44.12 and Mark Mason 49.39. In the ladies’ race Rhian Roxburgh of the GOGs finished in 31.52 (10.48 swim and 20.06 run). Youth category winner Rhiannon Kamink of Colwyn Bay Athletic Club finished second with a minute improvement on her 2017 time in 34.16. In third place another Junior Category winner was Kate Pugh of Wrekin Triathlon Club in 34.52. After Rhian, the next lady GOG home was Gemma Moore in 35.41. She was followed by Sasha Jones 37.22, Emer Sandham 38.09, Angie Hughes 41.49, Jen Wells 42.00, Geri Evans 44.17, Steph Conwy 44.44, Dinah Hazeldine 53.44, Cheryl Stewart 54.46, Lucy Bradley 53.48 and Deborah Robinson 56.44. Welsh Championship medals were awarded across the age categories and photographed below (courtesy of Steve Jeffreys) are the various winners. Elsewhere on Sunday Andy Jones travelled to Warrington to take part in the Birchwood 10km. Andy recorded a great time of 40.55, finishing in 95th place overall and 12th in his age group. Chester city centre was a hub of triathlon activity at the weekend for the Deva Olympic and Middle distance triathlons at Grosvenor Park. The GOG Squad were well represented in both races with some promising times recorded and age group wins. In the Olympic Distance race Sion Kelly Williams was first home for the GOGs in 2.18.06. He was followed by Tim Burnett 2.20.27, Paul Hooson 2.40.03 and Simon Adey Davies 3.14.00. In the ladies race Joni Stubbs Thrush clocked a strong swim and bike to finish in 2.45.11. Club members Alex Aldous, Paul Algieri and Sasha Jones formed a team to take part in the relay and finished second in 2.26.13. In the Middle Distance race Jack Smith-Keegin had a great race finishing 6th overall and 2nd in his age in 4.22.12. Grieg Best made a substantial improvement on last years’ time finishing in 4.31.05, taking 3rd in age. Peter Ward recorded a time of 4.38.01 also taking 1st in age. Alex Hatton finished in 4.45.22, Martin Witty 4.58.38, Andrew Brazier 5.15.23, David Griffith 5.18.42, Merf Jones 5.29.12, Ashley Tomlinson 5.43.44, Carlo Galeotti 5.50.06, Mark Roberts 4.46.32 and Martin Pritchard 6.58.48. Emer Sandham was first GOG lady home in 5.19.12. Laurie Griffith finished in 6.09.56. Sasha Jones formed another relay team for the middle distance race taking on the swim leg with team mates Sarah Gallacher and Mared Dafydd, the ladies team took the middle distance relay title in 5.04.03. Elsewhere over the weekend the GOG Squad turned out in force for the Deganwy Dash 5 mile race on Friday night. Simon Cole Simon took second place in 27.11. Andrew Williams was next home in 33.23, Scott Butterworth 33.29, Andrew Roberts Male 35.03, Bleddyn Evans 35.25, Paul Algieri 35.47, Grant Falconer 36.14, Samuel Holt Male 36.39, 53 Steve Dutton 37.49, 4 Peter Armstrong 40.18, Sion Jones 42.12, Richie Bartlett Male 42.41 and Stephen Jones 46.01. Victoria Cole was first GOG lady home in 10th place overall in 36.45, Claire Scoots finished in 40.01, Ann D’albuquerque 41.14, Sarah Marriot 46.30, Geri Evans 48.43, Nan Roberts 48.43 and Llinos Davies 50.24. At the Abersoch 10km on Saturday Adrian Leonard was first GOG home in 27th place in 41.46. Simon Baldwin finished in 45.40 and Mark Roberts 58.40. 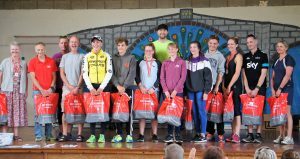 It was a weekend of pure multisport for the GOG Squad with triathletes taking part in local races in Llanberis and GB Qualification races in the north west. On Saturday Joni Stubs Thrush travelled solo to the National Watersports Centre to take on the Nottingham Sprint Triathlon. Amidst tough competition Joni had a good race overall with a solid bike and run to finish in 1.15.29. In Llanberis the Always Aim High Sprint Triathlon first home for the GOGs was Pete Borlace in an impressive 1.25.38. He was followed by Simon Baldwin in 1.26.37 and Malcolm Jones who was second in his 60+ age category in 1.43. Amy O’Hare was first GOG female taking first in the U23 age category and finishing in 1.40.28, Pippa Jones finished in 1.42.40, and Angie Hughes in 1.43.06. 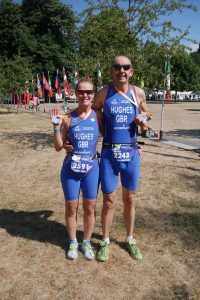 In the Duathlon, GOG Coaches took control of both races with Rhian Roxburgh and Geran Hughes taking 1st and 2nd place in the female and male races. Crossing the line within seconds of each-other Rhian finished in 1.23.17 and Geran in 1.23.03. On Sunday a few club members took part in the Southport Sprint Triathlon, a 2019 European age group qualification race. The swim takes place in the Marine Lake and the flat fast bike and run around the seaside town make for some brisk racing. Matthew Ashton finished in 3rd in his age in 1.08.36, enabling him to qualify for team GB. Paul Algieri clocked 1.10.06 and Lewis Myatt 1.21.50. At the Cheshire Sprint Triathlon in Nantwich the Alex Hatton led the charge for the GOGs finishing 7th overall and third in his age category in a fine time of 1.03.37. A number of newer club members also took part in this race with John Farrell finishing in 1.31.52 and Wayne Roberts completing his first triathlon in 1.46.54. Michelle Farrell finished in 1.31.31. In the Slateman Classic race on Sunday Gareth Bowyer was first home for the GOGs in 2.47.32. Sion Kelly Williams followed in 2.50.59. Richard Smith rode a strong bike leg to finish in 3.13.25. Merfyn Jones clocked 3.31.10, Joshua White 3.32.46, Jason Breaky 3.34.42, Mark Roberts 4.04.05 and Chris Bassitt Kent 4.09.47. In the lades race Amy O’ Hare finished in 3.36.16 and Tabita Angle Smith 4.12.59. Amy O’Hare one of the clubs youngest and most promising athletes completed the Slateman Savage competition, which involves completing both the Sprint and Savage races on consecutive days. Having recorded good results in both races, impressively Amy took the Under 23 Slateman Savage title. GOG Triathletes Helen Mcarthur and Andy Jones stepped out of their comfort zones at the weekend to take part in the Quest Wales Adventure Race at Llyn Gerionydd and around Gwydir Forest on Saturday. Adventure racing comprises of a run, bike, kayak, run, bike format and sees competitors covering a range of distances in the three disciplines. Helen took on the 42km Sport Race, which comprised of 17km of trail running, 1 km kayaking and 24km of hard biking. She had a great race taking 2nd placed female overall in 3.10.14. Andy Jones did the tough 53km Expert Race, which had an additional 7km run and 4km bike to the Sport race. Andy performed well across the board finishing in 3.23.02, 7th place overall and 1st in his M40 age category. On Sunday Prestatyn Running Club organised the Ffrith 5km race and the flat course saw a number of the GOG Squad clock some fine times. First home for the GOGs was Eduardo Vega in and impressive 17.12, he was 5th overall and 2nd in the Senior category. Next home was Geran Hughes in 18.32, 7th overall and 1st in age V50. He was followed by Craig Rutter 19.52, Paul Hooson 21.30, Chris Bennett 21.58 and Peter Armstrong 23.21, 3rd in age Vet 65. Angie Hughes was the first female GOG to finish in 24.07. She was followed by Ann d’Albuquerque in 24.33 and 1st in age Vet 65, and Bethan Hooson in 33.36. Sunny 6th, 7th May 2018- Ruthin Sprint and several runs. GOG Squad Triathletes shone this weekend in the wall to wall sunshine that graced the North Wales coast. On Saturday at the Run Wales Big Rock 10km race in Penmaenmawr. Helen McArthur was first home for the GOGs in 6th place overall and second in her age category 46.26. She was followed by Hayley Price Jones 14th overall and first in her age group in 51.29. Stephanie Conwy finished in 51.35. Down in Llangollen the Trail 10km race was held also on Saturday. Continuing his fine form Andy Jones was 6th overall and 2nd in his age group in 42.02. He was followed Craig Rutter 44.02, Lewis Myatt 44.02 and Andrew Roberts 1.07.18. Nan Roberts also finished in 1.07.18. And further south Gavin Roberts came in 3rd in the Ras y Moelwyn which included 2900ft ascent over 9.5 miles. Ruthin Tri Stars held their annual sprint triathlon on Sunday. The GOG’s were well represented on the podium with age group prizes for Adrian Leonard, Paul Algieri and Martin Witty. Adrian was 5th overall with solid performances across the disciplines in 1.09.54. Paul Algieri was 7th in 1.12.13. Eduardo Vega was one of only three triathletes all day to record a sub 20 minute 5km run to finish in 12th place overall in 1.14.13. Martin Witty finished in 1.15.41, Chris Bennett 1.18.31, Bleddyn Evans 1.19.11, Jason Breakey 1.23.54, Simon Hick 1.27.56 and Mark Roberts 1.34.44. Laura Lamb was first female home for the GOGs in 1.37.21, she was followed by Dinah Hazeldine in 1.55.31. The duo of Deborah Robinson and Malcolm Harrison started well with an PB in the pool for Deborah and went on to win the team relay in 1.36.51. 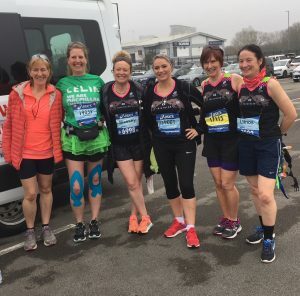 At the Llyn Brenig and Alwen two lakes trail races the club was represented by Cheryl Stewart, Michelle Lindfield, Sonja Griffiths, Sharon Hughes and Andrew Elwood. Finally, some members crossed the border to run the Liverpool Spring 10km race. Andrew Williams had a good run to finish in 41.18. Steve Jones was next home in 58.01. Mared Dafydd was the sole female representative for the club finishing in 44.37. 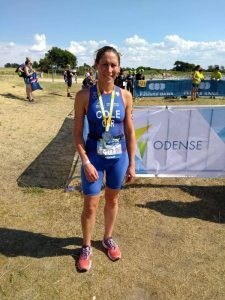 GOG Triathlon Club had representatives taking part in several events at the weekend, with some good results recorded in the spring sunshine. In Machynlleth Cerist Triathlon Club hosted the Dyfi Dash Sprint Triathlon. The event was won by the unstoppable GOG Simon Cole who recorded the fastest run split of the day to complete the course in a fantastic time of 57.45. Finishing in 7th place overall with consistent results across the disciplines to take second in his age category was Matthew Ashton in 1.04.44. Next home was Jonathon Seymour in 1.06.26, Simon Baldwin in 1.10.07, Mark Roberts in 1.28.58 and Malcolm Harrison in 1.29.04. In the ladies race Emer Sandham was third overall in 1.13.50. Next to finish was Pippa Jones in 1.22.19, followed by Angie Hughes who was second in her age category in 1.22.32, and Dinah Hazeldine in 1.51.41. Paul Algieri and son David travelled to Ormskirk to the West Lancs Triathlon on Sunday. Paul recorded an impressive 1.04.38 to finish 5th in his age category. David who was taking on his first triathlon finished in a respectable 1.19.11. Finally Eduardo Vega had a strong run at the Tatton Park 10k run, finishing in third place overall in 36.13. And in Rome Neil Vicars Harris finished the Rome Marathon in 3.43.24. 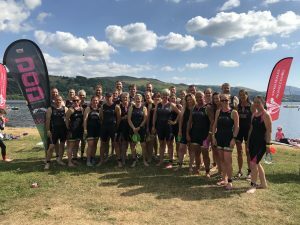 GOG Triathlon Club hosted the 11th annual Llanrwst Sprint Triathlon on Sunday with triathletes travelling from all over the region to race alongside a high proportion of GOG club members. The 400 metre swim took place at Llanrwst Pool, the 25 km cycle saw competitors ride up to Tal-y-Cafn, cross the Conwy River and back down the Valley through Trefriw to make their way back to the Llanrwst Bowling Green Carpark, where they then embarked on a 5 km run up to Gwydir Forest and back. The race was a sell-out with 153 entries over a range of age categories from 15 to 60+. Despite the tough run course, the club event is renowned for being a beginner friendly race owing to the fact the organisers and most marshals also take part, and fully appreciate that encouragement should be mustered for all levels of competitor. Near perfect conditions on Sunday made for fantastic racing with fast times recorded on the bike and run. The male competition was dominated by the home club with a 1-2-3 for the GOG Squad. Jack Smith-Keegin had an incredible race recording a 4.49 swim, 36.56 bike and 19.04 run to finish 1st overall in 1.03.22. In 2nd place was young Welsh Triathlon Star Sam Johnson in 1.04.15. Gareth Bowyer took 3rd in 1.07.31. The female race was won by visitor Sarah Ryder of Wrecsam Tri in 1.16.08, with a 8.50 swim, a very strong 42.34 bike and 22.56 run. In 2nd place for the second year running was GOG’s Emer Sandham in 1.18.50. Third place was won by experienced Super Veteran Bridget Ripley in 1.20.04. The age group results were as follows; in the youth category Tomos Land of Conwy Tri Stars was 1st in 1.18.04 and representing the girls Welsh Triathlon Academy’s Mali Jones was 1st in 01:24:27. In the Junior category GOGs Sion Kelly-Williams finished in 01:11:31 and Colwyn Bay Athletics Rhiannon Kamink finished in 01:22:18. Out of the 19 Senior 1 age group triathletes competing, Stephen Price of Blackcat Cycling Club was 1st in 01:12:45 and Toni Whitney was 1st female in 01:25:17. There were 38 Senior 2’s competing and GOGs took both male and female 1st with Matthew Ashton finishing in 1.10.36 and Sarah Gallacher finishing in 1.23.19. The Veteran category was particularly competitive, with GOGs Tim Burnett finishing in 1.10.39 and Claire Birch of OO Tri finishing in 1.26.41. Of the 33 Super Veterans registered GOGs Pete Ward finished in 01:10:55 and GOGs Vicky Ronald in 1.22.27. The Vintage Veterans category had 12 competitors with Colin Hunt of Wrecsam Tri finishing in 1.18.48 and Vicky Cortvriend of Denbigh Harriers finishing in 2.03.17. Llanrwst Triathlon is a popular event which couldn’t have happened without the support of a number of local business around the Conwy Valley and beyond including; Evolution Bikes, Betws based Kingud bike cleaning products, Meriden Bars, Jones Crisps, Llanrwst produced Aberffraw Biscuits, Beech Homes, Clear Accounting, Cotswolds, Trirox Training, Coop Rhuddlan, Coop Llanrwst, Carlos Restaurant, Goodwinesonline, Muc-off, Rydal School and The St George Hotel. The club would like to thank all of its sponsors for supporting this hugely successful event. Swimming and running were the weekend activities for the GOG Squad this week with members of the club taking part in swim races in Llanberis on Sunday and the Dee Mile last Saturday and running events as far afield as Ireland. Joni Stubbs-Thrush took to the Dee in Chester alongside 425 other swimmers and had a good swim finishing the mile and a quarter race in 32.36 in 54th place from a field of 192 women. In Llanberis there were three distances in the Big Brutal Swim in Llyn Padarn. Daragh Reynolds took on the epic 10km swim and finished in 17th place in 2.53.20. Simon Roxburgh did the 5km distance, finishing in 20th place in 1.26.22 and Paul Hooson did the 2.5km swim finishing in 10th place in 39.32. On to running where Gavin Roberts ran the Maesgwm Muddle Fell Race on Saturday finishing in a fine 31st place in the 8.7mile British Championship race in 1.42.56. A group of GOGs headed across the water to Ireland on Sunday to take part in the Dublin Rock’n’Roll Half Marathon. Sarah Massey, Sarah Marriot and Celia Free showing true team spirit, crossed the line together in this unique half marathon in 2.28.40. Finally, Rich Smith upped his running distance to run the Newark Half Marathon alongside 1032 other runners, finishing in 1.56.34. The Always Aim High Snowman Triathlon was held in Capel Curig at the weekend and the GOG Squad had triathletes competing both days. 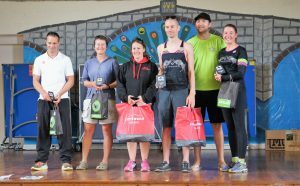 The first event was the sprint triathlon on Saturday and the GOG Squad were well represented and took podium positions. The race starts with a 400-metre swim in Llyn Mymbyr, then athletes cycle to Llanrwst, and finally take to the trails around Plas Y Brenin for a 5km run. Gareth Bowyer was first home for the GOGs in 3rd place overall in 1.19.35, he was followed by Rhys James in 1.28.03, Paul Algieri in 1.30.0, a great time which earned him first in his MV50 age category, and Simon Baldwin in 1.37.38. In the lady’s race Lisa Scoots finished 1.37.48 and Dinah Hazeldine 2.26.06. The Full distance of the Snowman was on Sunday. It comprised of a 1000m swim, 70km bike leg taking in the Crimea Pass from Blaenau and then an epic run to the summit of Moel Siabod and back. Gareth Bowyer returned on Sunday to race the full distance, undertaking both races is a separate event known as the ‘Snowman Savage’. With boundless energy, he had another great race finishing the race in 6th place overall in 3.43.39, which left him in second place in the Savage event. Next home was Sion Kelly Williams in 4.07.55, then first time triathlete Jason Breaky in 4.28.16, followed by Merfyn Jones in 4.34.32, Carlo Galeotti in 4.51.30 and Chris Kent in 6.07.18. Emer Sandham was the sole female representative on Sunday and finished in third place overall in 4.23.40. Elsewhere Paul Hooson returned to his racing roots to take part in the Salford Sprint Triathlon, finishing well in 39th place overall in 1.20.25. Gavin Roberts took fourth place overall and first in his age category in the tough North Wales Half Marathon, finishing the race in 1.26.35. Over in Holyhead Andy Jones raced the Cybi Striders Holyhead Breakwater race, finishing in 6th place overall in 32.49. Craig Rutter also ran the 5 mile race in 35.55. The GOG Squad had a great turnout on Wednesday last for the Eryri Harries Rasio’r Tren. The race which sees runners take the Welsh Highland Train up to Dinas and chase it back to Caernarfon is a fun event and attracts a good field of runners and fast times owing to the slightly descending course. Daragh Reynolds with legs fresh from the Snowdon race on Sunday was the first GOG home, taking 12th place in 17:18. Next to finish was another Snowdon runner David Griffith Male in 19:38. He was followed by Robin Sandham 20:00, Andrew Ellwood 22:43 and Rob Stewart 23:41. Emer Sandham was the first female GOG to finish in 10th place in 19:40. She was followed by Ellie New in 20:49, Laurie Griffith Female 22:46, Sarah Marriot 25:36, Sarah Massey 25:41, Sarah Ellwood 26:24, Celia Free Female 30:14 and Cheryl Stewart 30:17. Elsewhere Joni Stubbs Thrush took part in the Wales in a Day Cycle Event on Saturday. Joni had a great ride and despite tough conditions on the gruelling 185 mile ride from Caernarfon through the central Wales all the way to Chepstow was the first lady to finish in a fantastic 15 hours 25mins. Simon Hick has just returned from France where he undertook the Etape de Tour, an event which sees cyclists ride a stage of the Tour De France prior to the professionals rolling into town. This year the 18th Stage was 181km long and took in the classic climbs of the Col du Var and Col d’Izoard. Hick finished the event in 11.28. Finally closer to home on Sunday Paul Cheetham ran the Scott Snowdonia Trail Half Marathon finishing in 3.31.03. Geri Evans ran the 10 km Trail finishing in 40th place in 1.23.12. Porth Eirias was a hive of activity on Saturday as GOG Triathlon Club hosted the Welsh Aquathlon Championships. The Aquathlon was a 750m swim to 5km run race format, which saw competitors started the race on the beach, run into the sea and swim two laps of a 350m course, then back up the beach to remove wetsuits in transition to run eastwards to Rainbow Bridge and back to finish on the roof of the iconic building. The event was well attended with club members racing against athletes from all over Wales and there were some some super-fast results from both locals and visitors. Sam Johnson was first home for the GOG’s in second place overall in a fantastic time of 28.43, where he recorded a sub 10-minute swim and 18.28 run. Other male results were as follows; 12th Tim Burnett 34.18 (second in age), 14th Gareth Bowyer 34.52 (3rd in age), 17th Sion Kelly Williams 35.38 (second in age), 18th Chris Wynne 36.14 (2nd in age), 19th Paul Algieri 36.21 (3rd in age), 22nd Andrew Williams 37.02, 23rd Paul Hooson 37.07, 24th Andy Brazier 37.25, 26th Sion Hughes 37.44, 31st Merf Jones 39.15, 33rd Stu Goldsack 39.26, 35th Richard Smith 39.38, 38th Alex Williams 41.26, 40th Paul Cheetham 41.44, 42nd Phill Coppin 44.19, 43rd Rob Stewart 44.24, 44th Bleddyn Evans 44.24, 45th Russell Reid 45.23, 46th Rory Fish 46.06. Vicky Cole took second place in the ladies’ race in a great time of 34.51, also first in the senior female age category. Other female results were; 7th Ellie New 40.18 (3rd in age), 10th Evelyn Heffernan 47.29 (2nd in age), 11 Geri Evans 47.31 (3rd in age), 14th Dinah Hazeldine 55.56 and 15th Deborah Robinson 1.02.25. In Church Stretton Merilin Sikk ran the Piece of Cake half marathon, a trail race through the Shropshire Hills and Long Mynd. Merilin ran well and was the fourth female to finish in a time of 2.05.40. The Snowdon Race also took place on Saturday and it was great to see GOG Triathlon Club members taking part in this truly international race. First to finish for the GOG’s in 46th place out of the 461 runners on the mountain was Gavin Roberts in 1.20.55. He was followed by Daragh Reynolds 1.34.34, David Griffith 1.36.48 and Laurie Griffith 2.11.51. On Sunday over in Chester the Deva Divas Sprint Triathlon was hosted by Chester Triathlon Club, the event comprised of a 750m swim in the River Dee, a 25km bike leg out towards Pulford and a 5km run on the Meadows. First to finish for the GOG’s was Emer Sandham in 5th place in 1.24.07, followed by Joni Stubbs Thrush in 17th in 1.29.30. Angie Hughes was 31st overall and made a fantastic return to triathlon finishing first in her age category in 1.34.59. Paula Stevens was next home in 1.41.54. Cheryl Stewart made her triathlon debut and finished in a respectable 1.54.12. Dinah Hazeldine fresh from Saturdays Aquathlon raced well again in Chester to finish in 1.59.41. Members of GOG Triathlon Club travelled the length of Wales this weekend to take part in the Cardiff Triathlon, whilst others stayed closer to home to compete on more familiar terrain and the home of the GOG Squad in Llandudno. The Llandudno the Sea Triathlon sprint race attracted stiff competition on the basis of it being a World Championship qualifier this year. The race comprised of a 750m sea swim, two bike laps of the Great Orme and 5km run towards the Little Orme. Gareth Bowyer led the locals home in 1.12.12, taking first place in his age category. He was followed by Geran Hughes in 1.19.06, Paul Algieri in 1.22.24, Merfyn Jones 1.26.04 and Simon Adey Davies in 1.48.58. Deborah Robinson represented the ladies finishing in 2.42.02. 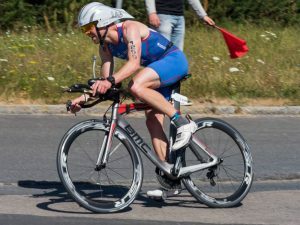 For the first time in Llandudno there was also a middle-distance race taking place which involved a 1900 metre swim, 87km cycle and 20km run. Gavin Roberts upped his racing distance to take this on and despite an early puncture on the bike, finished with a strong run in 12th place and third in his age category in 5.28.09. Elsewhere over the weekend Paul Hooson raced on home turf in the 5km race in Rhyl Runfest finishing 16th overall and 3rd in his age category in 22.03. Daragh Reynolds ventured north on two wheels to compete in the gruelling C2C in a Day Sportive; a 242km cycle from Seascale to Whitby finishing in 11 hours. Finally Emer Sandham returned to training with the GOGs this week following her recent trip to the European Triathlon Championships in Kitzbuhel in Austria, where she was competing for her home nation Ireland in the olympic distance race. She finished in 2.47.45, 20th place in her age, a respectable result on a tough course and the fact it was her first time competing at this level. It was a busy week for the Gog triathlon club with members competing in events all over the North West. Gog triathlon were well represented at the Abersoch triathlon which is part of the Abersoch Triple crown. This is a very popular and competitive event with triathletes travelling to North Wales from all over the UK. First home in the sprint race was Simon Roxborough in a time of 1:13:50 finishing a very credible seventh overall and third in age group. Next home was Daragh Reynolds in 1:18:19, 14th overall. Simon Baldwin 1:21:57, Paul Hooson 1:25:54. Sarah Gallacher 1:26:17 was second in her age group and enjoyed her first podium finish with Dinah Hazeldene coming home in 2:04:27. The Gog squad team consisting of Stuart Goldsack, Ashley Tomlinson, and Andrew Williams completed The Olympic distance in 2:34:09 finishing 13th overall. Three Gog’s competed in the Deinolen 10k on Wednesday. Gavin Roberts finished 5th overall in 38:27. Sion Kelly Williams was 8th overall in 40:24 and Jason Breakey 52:44. Paula Stevens competed in the Port Sunlight 10k finishing in 57:45. Andy Jones ran a 1:33:55 at the Potters Half marathon in stoke on Trent. Also Gavin Roberts came second overall in the Holyhead Mountain Race in 53.40. With multisport high on the local agenda, last weekend saw members of the GOG Squad taking part in a variety of events. On Friday night the popular Deganwy Dash 5 mile run returned to the racing calendar. Simon Cole fresh from his recent European event in Spain stormed around the course finishing 3rd overall in 27.27. The flat course and perfect conditions made for some good times with Andrew Roberts recording 34.07, Craig Rutter 35.12, Simon Blain 35.36, Chris Bennett 36.20, Evelyn Heffernan 44.48, Sarah Marriot 47.23, Llinos Davies 47.40 and Nan Roberts 48.06. 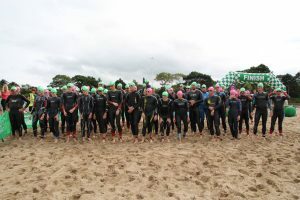 In Abersoch on Saturday the first race of the Triple Crown Series was underway early with the Henri Lloyd 10 km. This is a tough undulating course with the added test of having to run the final kilometre along the beach. Daragh Reynolds had a fine race rising to the challenge to finish 7th overall in 37.42. Next home was Simon Roxburgh 41.23, Andrew Williams 44.02, and Simon Baldwin 48.01. Vicky Cole ran well to finish first GOG lady and 13th overall in 48.04, she was followed by Sarah Gallacher 49.39, Sarah Massey 1.05.10, and Celia Free 1.05.14. On Sunday the GOG Squad were well represented in the Chester Triathlon Club run events based in Grosvenor Park and in the River Dee. In the standard race Jack Keegin Smith finished first for the GOGs in 45th place in 2.07.19. He was followed by Tim Burnett 2.15.50, Paul Algieri 2.25.16, David Griffith 2.31.30, Stuart Goldsack 2.52.30, Richie Bartlett who was taking on his first standard distance triathlon 2.52.46 and Arwyn Jones 2.55.56. Also taking place was a Middle distance triathlon, involving a 1900m Swim, 87km Bike and 21km Run. A number of the GOG Squad upped their racing distance to take part in the middle distance triathlon but it was the more experience long distance triathlete Grieg Best who finished first for the GOG’s in 36th overall in 4.43.52. Next home was Sion Hughes 5.10.26, Carlo Galeotti 5.10.52, Andrew Brazier 5.18.58, Richard Smith 5.23.40, and Paul Sanders 5.46.26. The only GOG female to take on the race was Laurie Griffith who raced well to finish in a respectable 6.14.52. The Bala Middle distance triathlon also took place on Sunday. This is a well-established race set on a testing course around the Gwynedd countryside with a swim in Llyn Tegid. Ironman-in-training Alex Hatton finished first for the GOGs in 24th place overall in 4.48.20. He was followed by Sion Kelly Williams 5.09.01 and Peter Ward 5.17.13. As the race was also hosting the Welsh Championship Welsh Middle Distance Kelly Williams’ efforts saw him awarded as the Junior Welsh Middle Distance Champion. Two of the GOG Squad had ventured further afield to race in the Strathclyde Park Triathlon Festival in Glasgow. Malcolm Harrison took on the sprint race finishing in 1.32.30. Deborah Robinson took on the super sprint finishing fourth in her age group in 1.10.13. Finally regulars at Parkrun may have noticed a GOG takeover last Saturday, which saw a number of the GOG Squad volunteering to assist with the weekly 5km run at Conwy RSPB. The club also used this opportunity to generate interest in their summer events including an Aquathlon in July and a Sprint Triathlon in August. If you are interested in taking part in these events or triathlon generally see the GOG website or Facebook group ‘GOG Triathlon’ for more information. 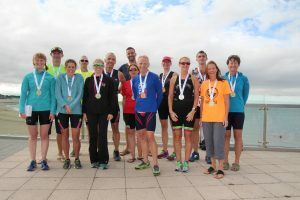 It was a very busy weekend for GOG Triathlon Club with members taking part in various races across the region. 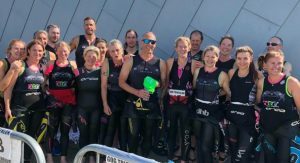 The Always Aim High Slateman Sprint Triathlon was the first event to take place on Saturday and the GOG Squad were well represented and rewarded across the age groups. The race started with a swim in Llyn Padarn, then athletes had to battle wind and rain up Llanberis Pass, and finally take to the trails of Padarn County Park for a 6-km run. Gareth Bowyer was first home for the GOGs in 7th place and second in his age group of +40 in 1.15.49, he was followed by Jack Keegin Smith in 10th place overall in 1.17.09, Tomas Aldous was 19th and second in his age group of under 23 in 1.22.39, Geran Huges was 25th and first in his age group of M50+, and Simon Baldwin 77th in 1.37. Amy Edwards was the sole female representative in the sprint race, and although this was only her first triathlon she finished in 17th place in 1.38.35 and most notably 1st in her age category Under 23. Sunday was the Standard distance of the Slateman, which was roughly double the distances of Saturdays route with the added bonus the notorious ‘Quarryman’ challenge run up through the slate quarries over Llyn Peris. Simon Roxburgh had a great race and was first home for the GOGs in 38th place overall from a field of 760 Males in 2.49.21. Gareth Bowyer took on the standard distance on top of the sprint on Saturday and finished in 55th place in 2.53.34. He was followed by Gavin Roberts in 3.00.58, Daragh Reynolds in 3.15.21, Carlo Galeotti in 3.19.18, Chris Bennett in 3.20.42, Martin King Shears in 3.22.29, Merfyn Jones in 3.29.17, Chris Van Hessing in 3.31.08, Gwyn Jones in 4.01.17 and Chris Hopkins in 4.08.22. Emer Sandham represented the GOG ladies in the standard race finishing in 3.13.19, 14th place overall from a field of 180 women. Elsewhere Matthew Ashton and Paul Algieri headed to Southport to take on the Southport Sprint Triathlon. In contrast to the Slateman this course is a flat seaside sprint and sees some super-fast splits across the disciplines. Both raced well with Ashton finishing in 42nd place from a field of 280 in 1.09.00 and Algieri in 93rd in 1.13.24. Over in Nantwich Barry and Lyndsay Craven took on the Cheshire Sprint Triathlon. Barry finished in 1.51.18 and having made a big improvement on her 2016 results Lyndsay finished in 2.18.54. 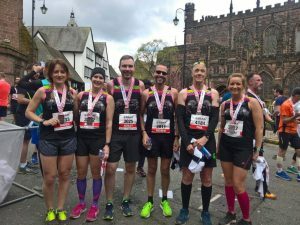 Finally, in the Essar Chester half marathon the GOG Squad had a team of 5 in action. Andy Jones continuing his fine form finished in 1.30.38, followed by another athlete getting stronger by the race Richie Bartlett in 1.47.33. Gareth Jones finished in 1.57.38 and Rab Aujila 2.43.38. Nicola Tomlinson representing the ladies finished in 1.50.02.